The deputy chairperson of the African Union Commission has launched an unprecedented attack on his boss, chairperson Moussa Faki Mahamat, South Africa's Mail & Guardian newspaper reports. In an exclusive report, writer Simon Allison says that Thomas Kwesi-Quartey has sent a letter to Ghanaian President Nana Akufo-Addo, "revealing deep divisions within the senior leadership of the AU and shedding more light on previous reports of nepotism and sexual harassment". 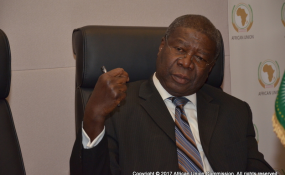 In the November 6, 2018 letter, seen by the Mail & Guardian, Kwesi-Quartey says that the chairperson had gone over his head to appoint an "old crony" as AU Ambassador to Brussels. Ahmat Awad Sakine, a Chadian diplomat, was appointed as the AU's permanent representative to the European Union in September 2017. The Mail & Guardian says that the authenticity of the letter was initially confirmed by Kwesi-Quartey's spokesperson, Doreen Appolus. But in a text message several hours later, she retracted the confirmation. AU commission chair Faki declined to comment. The 32nd AU Summit is currently under way in Addis Ababa, with heads of state due to meet on February 10 and 11. In his letter, Kwesi-Quartey also confirmed that he was aware of sexual harassment and gender discrimination within the commission.